I’ve been on a real pumpkin/squash kick lately as evidenced by prior recipes. Why not keep going? 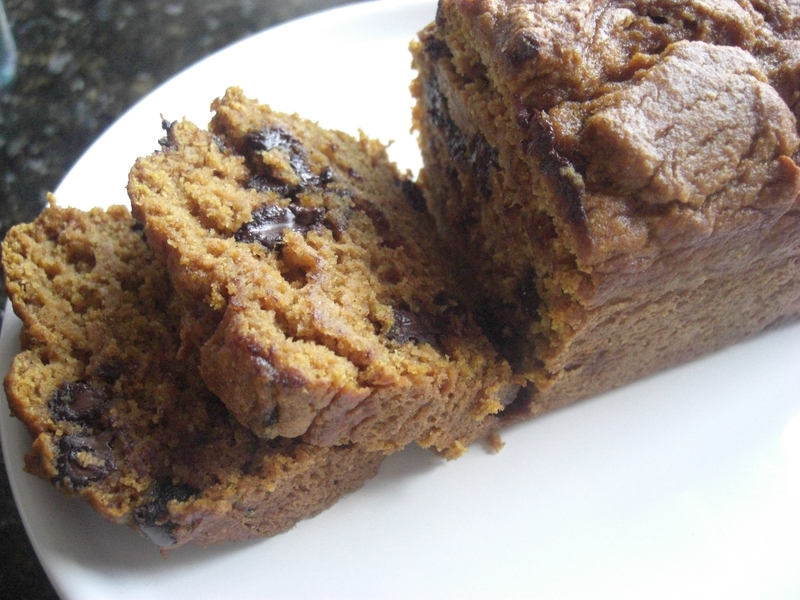 This past weekend I attempted and methinks succeeded in baking pumpkin bread with chocolate [for good measure]. The “two ways” title alludes to the two different types of chocolate used- semi-sweet and white. I am making this into a competition because I made two loaves and each had a different chocolate. The winner is…pumpkin bread with white chocolate! 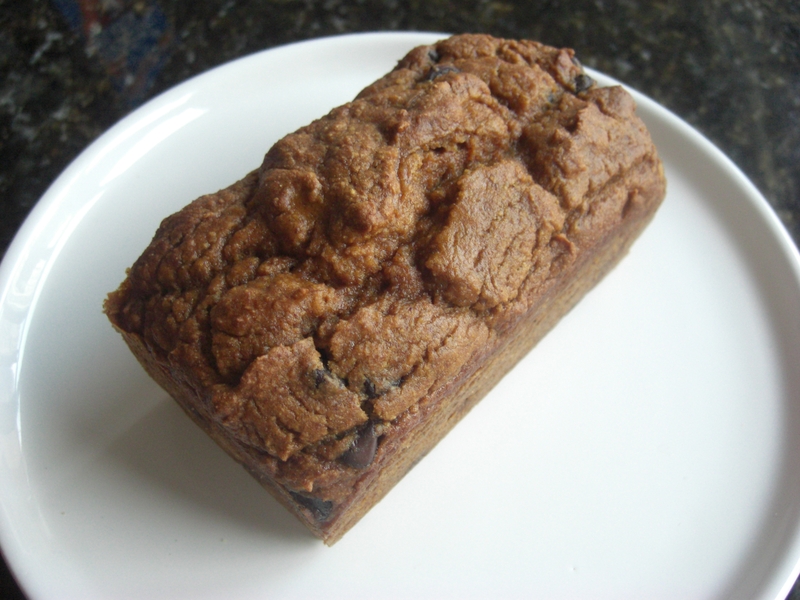 The two go together incredibly well and makes the bread into more of a treat than a breakfast loaf. 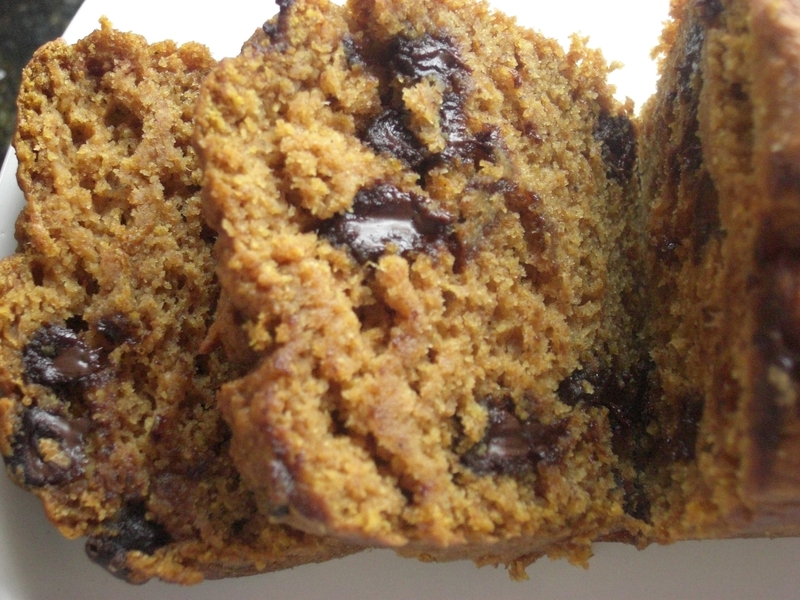 I only have pictures of the chocolate pumpkin loaf because…the white chocolate went really fast. The chocolatey bits evenly melted into the bread leaving the loaves almost marbled throughout. You don’t really need any butter or jam, the chocolate does it all while not being over-powering. I added a fruit element to the original recipe, so if you don’t have oranges in the house you can definitely go without the zest. This might just be the best gift you can bring to Thanksgiving if you aren’t doing the whole shebang yourself. Pre-heat oven to 350 degrees. Grease about three small loaf pans or one large loaf pans with non-stick spray or safflower oil. Mix pumpkin, sugar, egg, milk, oil, applesauce, vanilla and zest until combined – no electric mixer necessary! . In a separate bowl mix flour, baking soda, baking powder, salt, cinnamon and nutmeg. Slowly add to dry mixture into wet until just combined. Stir in chocolate chips. Pour batter evenly into loaf pans (or dump into large loaf pan). Bake for approximately 30 minutes (40 minutes for large loaf pan) or until tester comes out clean. Enjoy the scent while your loaves bake!